Black locust trees in full bloom are a milestone in the beekeeping year. Flowering plants are in bloom in abundance, providing plenty of nectar and pollen for rapidly growing bee colonies. A mid-spring hive inspection of bee hives finds the colonies in full expansion with bees bringing in lots of nectar and pollen to feed the brood of developing workers and drones. Honey bees produce drones only when they are needed, and in the spring there are plenty of drones in the hives. When we find significant numbers of drones walking about the combs on the edge of the brood nest, it is time to raise queens and make colony divisions. Employing a technique called grafting, beekeepers can readily produce extra queens at this time of the year by carefully moving the youngest larvae to queen cell cups and then moving these to queen-less starter hives. Colony divisions to increase hive numbers are easily created by moving excess queen cells that the bees produce naturally. Making colony divisions by moving bees and brood from crowded hives to new hives also serves as a method of artificially swarming the parent colony. These divisions are an effective method of reducing the colonies’ tendency to swarm. If during the spring hive inspection, the beekeeper finds a colony excessively crowded in its hive, the beekeeper may choose to reverse the hive bodies to relieve brood nest congestion. If the cells in the lowest brood nest hive body are empty, this hive body may be moved to the top of the brood nest to provide space for the queen to lay eggs. This action rapidly relieves brood nest congestion, the greatest cause of swarming. Today’s photo shows a healthy frame of capped worker brood holding pupae, the third stage of bee development. 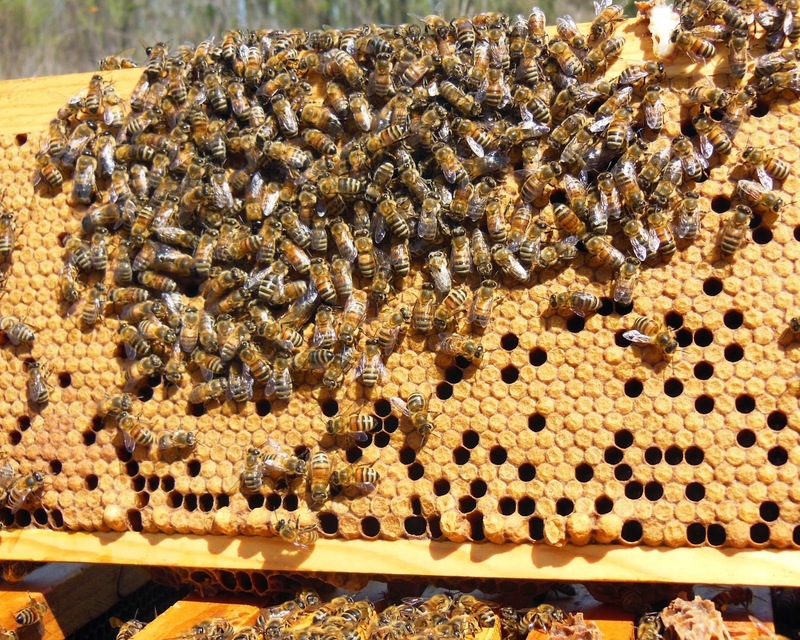 Continuous expanses of capped brood indicate a prolific queen. Excessive holes in the pattern may indicate brood nest congestion, brood disease, inbreeding, or hygienic behavior employed by the bees to remove parasitic mites.